Known for fantastic views, high-calibre golf and curling facilities, great food, and its ideal location for conferences and events, Canmore Golf & Curling Club is one of the Bow Valley’s most popular group venues for good reason. In May 2018, the Canmore Golf & Curling Club launched a brand-new Spring/Summer Menu at its popular Sandtraps restaurant, and a number of dishes have already emerged as firm-favourite crowd-pleasers. Here are the top 3. Sandtraps' new Cobb Salad is a hearty and reliable classic. With bacon, roast turkey, blue cheese, avocado, grape tomatoes, egg and summer greens, plus garden ranch dressing and garlic naan bread, salad never tasted so good. The Steak Sandwich: this is what you order when your hunger really means business. Sandtraps takes a six-ounce sirloin steak topped, tops it with onion rings, and serves it open-faced on a garlic baguette with house-cut fries and summer salad. One word: YES. For a light-yet-satisfying meal, the Rice Bowl is another stand-out from the new menu at Sandtraps. With sautéed vegetables and sesame orange ginger sauce, served on brown rice with garlic naan bread this some serious feel-good flavour. For an extra protein boost, add optional chicken, steak or seared tuna. That's our kinda bowl. Gluten-free friends, we have good news for you! All three of these flavourful dishes can also be made gluten-free upon request. 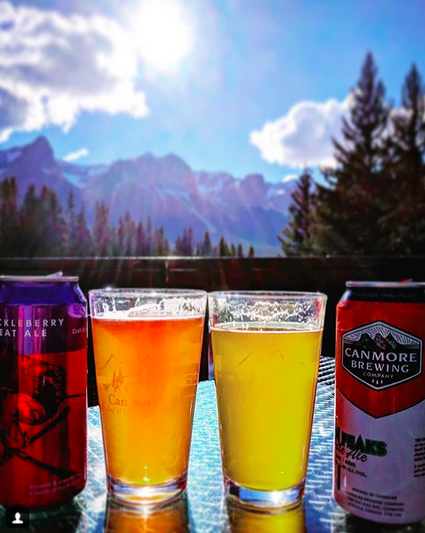 Whether you come to Canmore Golf & Curling club for the golf, the views, or the food, be sure to pay a visit to Sandtraps. This new menu is sure to impress. Limited tickets remaining. Find out more by clicking on the events above!